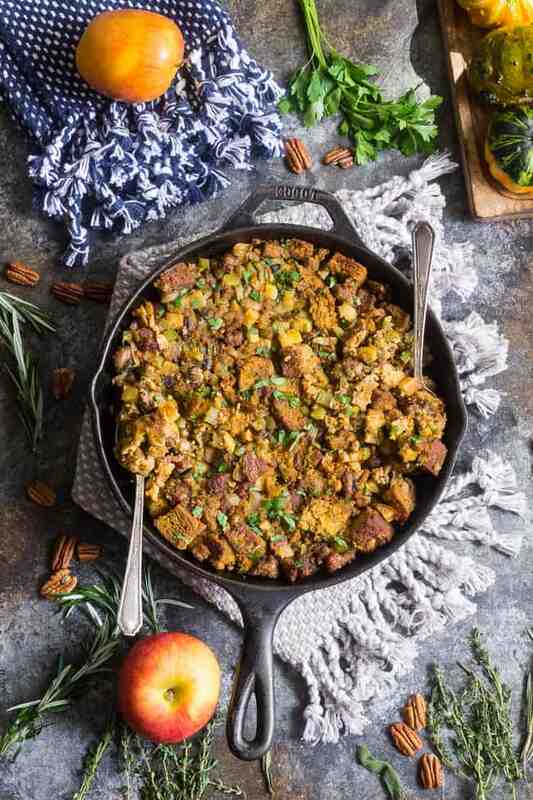 This savory and sweet “cornbread” Paleo Thanksgiving Stuffing is for all of you who want to keep with clean but still crave some bread in your stuffing! 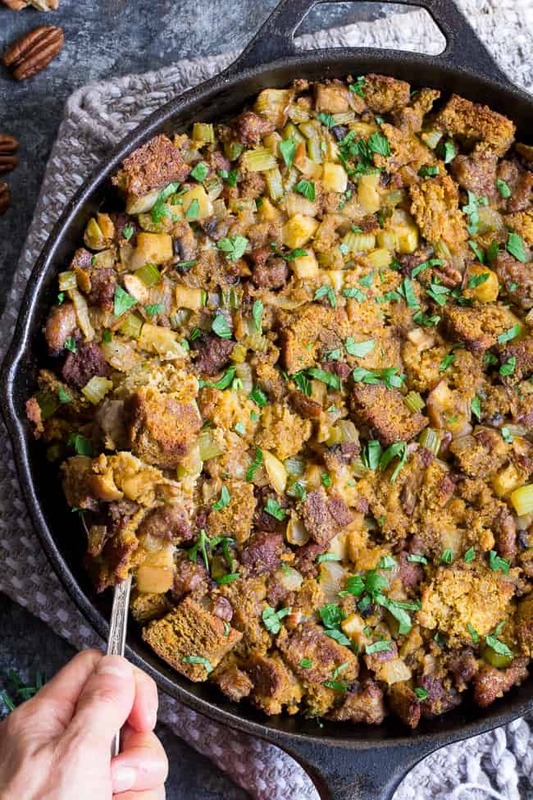 A grain-free, dairy-free sweet potato bread is cubed and baked with sausage, apples, celery and onion, mushrooms, pecans and herbs for a delicious, filling and healthy Thanksgiving stuffing reminiscent of the classic. I’m a stuffing fiend – I totally admit it. And while I already had 2 separate Thanksgiving stuffing recipes on the blog, I just had to have another! Not to mention that Thanksgiving is my favorite holiday. I think that tends to happen when you grow up Jewish and don’t have Christmas, anyone else? I wonder if that’s actually a thing. But, anyway, regardless of whether or not T-Day is among your favorite days of the year, I think you’re going to like this stuffing. 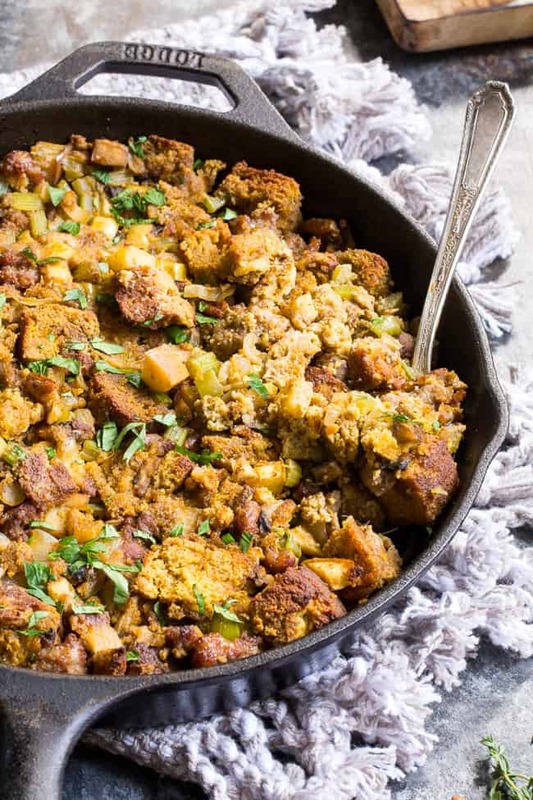 It’s definitely the closest I’ve made to an actual bread stuffing, and whether or not you think the sweet potato bread actually tastes like cornbread, it will likely be the closest thing you’ll taste that doesn’t actually have a speck of corn in it. Plus, the sweet potato makes the color pretty flipping exact, if I do say so. I mean, am I right about that?! Moving on, I’ll let you know that the “cornbread” part of this recipe was inspired by my savory sweet potato herb muffins from last year. 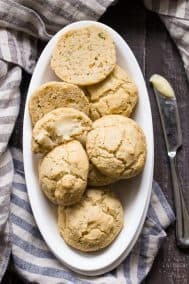 I remember eating them and thinking they sort of tasted eerily similar to herbed corn muffins, and conveniently placed the info in the back of my mind for the following fall season. 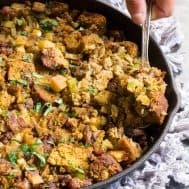 Last year, I made a sweeter version of Thanksgiving stuffing with my simple paleo pumpkin bread, which while yummy, isn’t savory enough to count as a “real” stuffing. Prior to that, I made a roasted butternut squash stuffing, which to be honest – is my absolute favorite (and also Whole30 friendly) – BUT it has no bread in it, which makes it just a bit too different for some to call it a “real” stuffing. Enter THIS stuffing. It has actual bread cubes in it (yay!) along with tons of savory, and sweet, goodies! We have sausage (although you can omit if you want it meatless), mushrooms, onions & celery, apples, and pecans. Plus, all those delicious savory herbs that make Thanksgiving smell and taste like Thanksgiving. 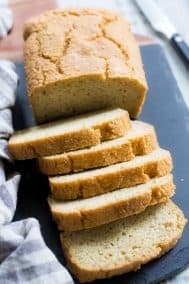 Add in a couple of whisked eggs and some bone broth and bake until the top is deliciously crisp and toasty, and you have a side dish that your whole family will love, and probably wouldn’t guess is Paleo. To prep this and make it easier for you, I highly recommend making the bread at least a day in advance, and up to 2. That way, you can cube it and allow the cubes to dry out a bit, avoiding the toasting step. However, it CAN be done all in the same day – just make sure you leave enough time for the bread to cool so you can cube it and lightly toast the cubes before mixing with the meat/veggie mixture. This recipe makes about 10 side dish servings, and you can easily double it to feed a larger crowd. It’s also totally fine to add more/different veggies to suit your preferences – simply chop them and add them in with the onions and celery. If you don’t have bone broth, you can also easily sub in organic chicken or turkey broth – I would use one lower in salt to avoid an overly salty stuffing. I hope you’re ready for all the best Thanksgiving flavors to fill your kitchen! Let’s cook! 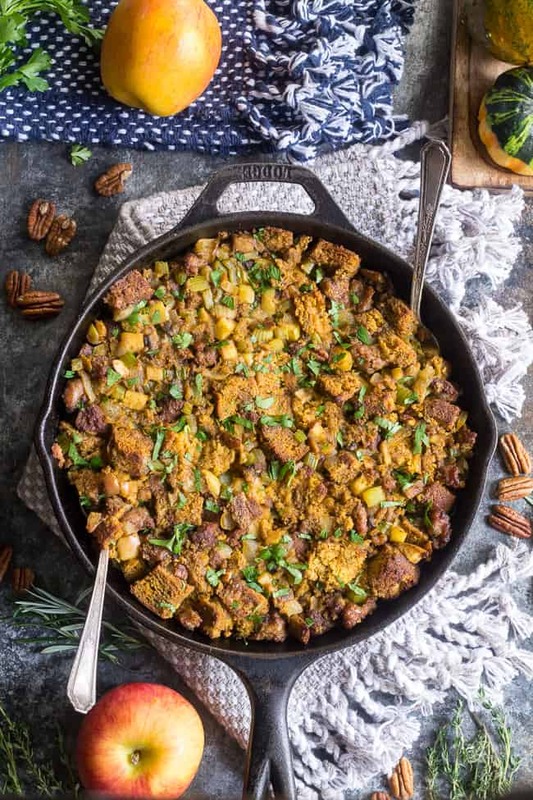 This savory and sweet "cornbread" Paleo Thanksgiving Stuffing is for all of you who want to keep with clean but still crave some bread in your stuffing! 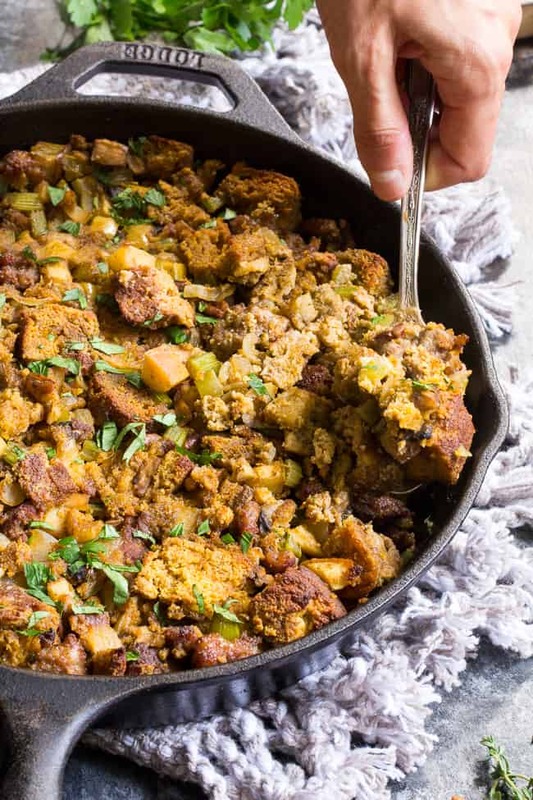 A grain-free, dairy-free sweet potato bread is cubed and baked with sausage, apples, celery and onion, mushrooms, pecans and herbs for a delicious, filling and healthy Thanksgiving stuffing reminiscent of the classic. Preheat your oven to 350 degrees and line an 8 x 8" baking pan with parchment paper. In a medium bowl, combine the dry ingredients and set aside. Then, in a large bowl, whisk together the sweet potato, eggs, honey or maple syrup, apple cider vinegar and coconut oil. Stir the dry ingredients into the wet until fully combined, then spread the batter into the prepared baking pan and bake 25 minutes or until set and beginning to brown. Allow to cool completely before cutting into 1" cubes. You can make this the day before and let the bread cubes dry overnight, or, toast them on a large baking sheet prior to using for the stuffing. Preheat your oven to 375 degrees. Heat a large skillet (cast iron/ovenproof is ideal) over med to med-hi heat and add the 2 Tbsp cooking fat. Once heated, add chopped onion and celery and cook for about 3-5 minutes, until softened. Add the mushrooms, chopped apples and pecans and cook for a couple of minutes until just softened. Now add the salt, poultry seasoning and sage. Lower the heat and stir to combine all flavors. Simmer for 2 more minutes, remove from heat and set aside to cool a bit. After the stovetop mixture cools enough to handle, toss it with the bread cubes, broth and whisked eggs. Transfer the stuffing to a large baking dish coated with a thin layer of coconut oil, and bake in the preheated oven for 30-40 minutes until toasty brown. Serve and enjoy! Want More Paleo Thanksgiving and Holiday Recipes? Try One of These! All-time FAVORITE Thanksgiving side dish? Can NOT wait to try this! Looks so good! Can I use the organic canned sweet potato for this ? That should work fine as long as it’s not too watery, if it is, drain it a bit before adding. Would this be good without any sausage? Yup, you can omit or add anything you want really! 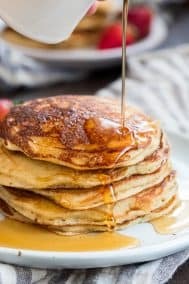 Is there an alternative to the almond flour? My won’t has sensitivity to almonds (I’m breastfeeding) so I’m trying to avoid it…but I don’t want to miss out on traditional thanksgiving meal! Thanks! Sorry…meant to say my son has sensitivity to almonds! Making this tonight in preparation for Thanksgiving. OMG!! 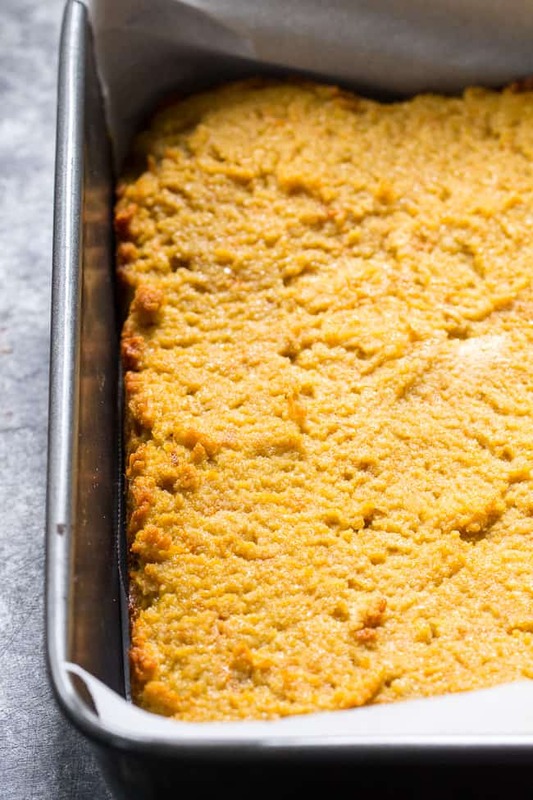 The faux cornbread is so yummy – I just know it’s going to be a hit!! Thank you & Happy Thanksgiving to you & yours. Awesome! Happy Thanksgiving to you! I am trying to convince my friends this year at our Friends-giving that Paleo is not only healthy, but delicious. I didn’t see exactly when to use the Bone Broth in the recipe. I look forward to trialing this soon! Can you stuff this in the turkey cavity like conventional stuffing? This was not a family favorite. It ended up too dry. Maybe if it was stuffed in the bird it would have been better. So, dressing is my favorite thing during the holidays. This year, while Im the one that takes our Southern Cornbread Family dressing, I also made this recipe. First, you could just stop at the Pumpkin Bread and it would be a win, but as a dressing, it was AMAZING. I used more whole pecans and no apples(acidic issues with my body). It felt so decadent chomping into those pecans, celery and mushrooms. Im pesca paleo (so no sausage) and a niece is GF. I think we felt extra special sharing something that of course, no one else even considered eating. Its visually appealing, all dark and wonderful. Made this last Thanksgiving. Very yummy, especially the “bread”. It was hard to not eat it all up before I made the stuffing!